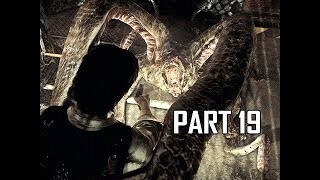 The Evil Within Walkthrough! Walkthrough and Let’s Play Playthrough of The Evil Within with Live Gameplay and Commentary in 1440p high definition at 60 fps. This The Evil Within walkthrough will be completed showcasing every level, mission, boss, and story ending. While investigating the scene of a gruesome mass murder at Beacon Mental Hospital, Krimson City police detective Sebastian Castellanos, his partner Joseph Oda, and Junior Detective Juli Kidman find themselves suddenly thrown into an unreal world, after hearing a high-pitched noise. Krimson City is destroyed and rearranged by a massive earthquake, and Sebastian wanders through unnatural forests and abandoned buildings full of monstrous creatures, and witnesses the apparition of a disfigured man in a white hood. Trapped in the nightmare world, Sebastian encounters one of Beacon’s doctors, Marcelo Jimenez, who is searching for his patient, Leslie Withers. Jimenez identifies the hooded stranger stalking them as Ruvik.